During the Edo Period (1603-1868), the area around the bridge was extremely popular among Osakans to enjoy the cool evening breeze. People would go boating here, have parties with geisha in boats or enjoy watching fireworks in summer. A small boat can actually be seen passing under the bridge in this photograph. In 1915, a new Naniwabashi was opened. It was located slightly east of the original bridge to connect with Sakaisuji (#11 on vintage map below) so that the new streetcar line on that recently widened avenue could use the bridge. The torii to Hokoku Jinja, built in 1879, can already be seen in this image, but Nakanoshima Park, which was built in 1891, does not yet exist. This image can therefore be dated to the 1880s. 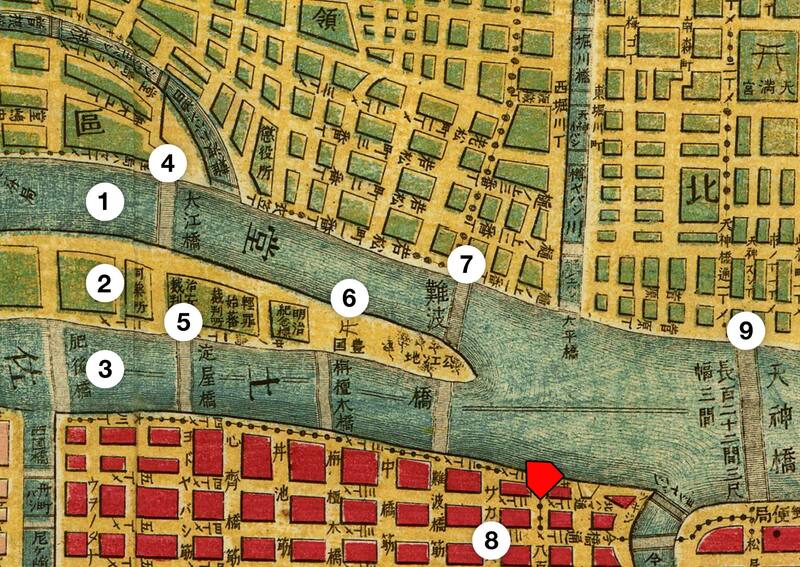 This detail shows some of the buildings along Dojimagawa. Yukichi Fukuzawa, whose face is displayed on the largest bill in Japan, the 10,000 yen bill, recounts some of his wild streaks during his youth in his autobiography. 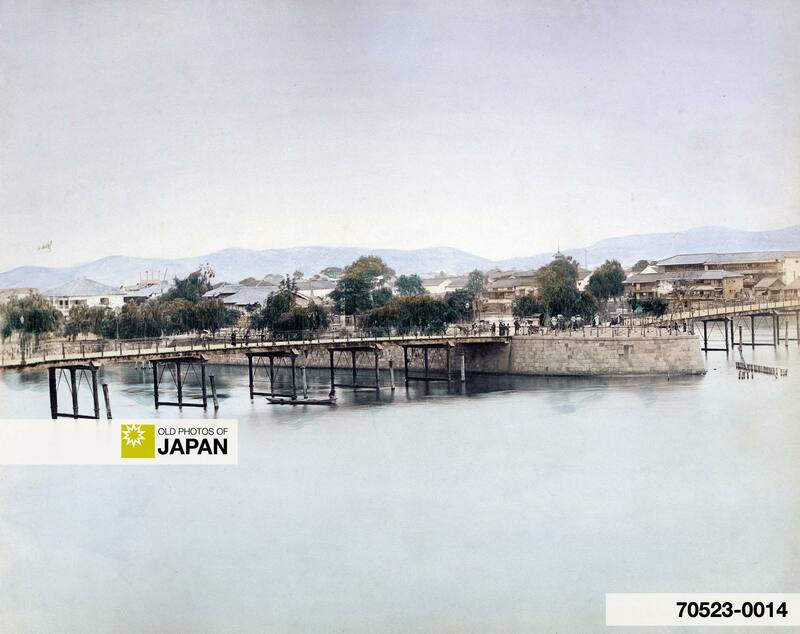 In one of such episodes, played out during the 1850s, Naniwa Bridge plays a leading role. “One summer night after ten o’clock one of the boys suddenly said that he was thirsty. He did not lack company; four or five of us decided to go out to satisfy this general thirst. The gate of the grounds was already closed according to the rule, but we threatened the gatekeeper and made him open it for us. We looked for one of those little eating-stalls with woven rush canopies, put up for summer stands. There we had dishes of devil-fish and cheap wine and started homeward after midnight, bringing along a few trays as usual. When we came to Naniwa Bridge, we saw a pleasure-boat moored underneath the piers. In it some men were having an obviously jolly time with their attendant geisha playing and singing. And into the boat I threw the trays before I knew it. The singing stopped at the last tray. We did not wait to see if anybody might be hurt, for we disappeared on the run. Curiously, a month afterwards, I learned the sequel of the incident. This rough person would go on to become a widely published author, inspiring teacher, translator for the government, an entrepreneur, a political theorist and the founder of Keio University. He is now seen as one of the founders of modern Japan. Something to ponder the next time you cross Osaka’s Naniwa Bridge. For a view of the Naniwabashi opened in 1915, see Osaka 1930s • Naniwa Bridge. 1883 (Meiji 16) Map of Osaka: 1. Dojimagawa; 2. Nakanoshima; 3. Tosaborigawa; 4. Higobashi; 5. Nishi-Yokoborigawa; 6. Oebashi; 7. Yodoyabashi; 8. Sendannokibashi (栴檀木橋); 9. Hokoku Jinja (A shinto shrine honoring Toyotomi Hideyoshi. It was built in 1879 and moved to Osaka Castle in 1961); 10. Naniwabashi; 11. Sakaisuji; 12. Higashi-Yokoborigawa. 3 Fukuzawa, Yukichi (1899/1972). The Autobiography of Yukichi Fukuzawa. Schocken Books: 74. 4 I have not been able to attribute this image yet. I suspect it may be from the Kimbei Kusakabe studio. You can also licence this image online: 70523-0014 @ MeijiShowa.com.